Maybe there isn't a giant bubble in Silicon Valley after all. Mark Cuban and many other observers see a repeat of the dot-com bubble forming -- this time in the startup world. They believe the valuations placed on young tech companies like Pinterest and Uber are ridiculous and only occur because there's a frantic rush to find the next Facebook (FB). But one of the tech world's smartest minds disagrees. "I don't think there's a bubble. 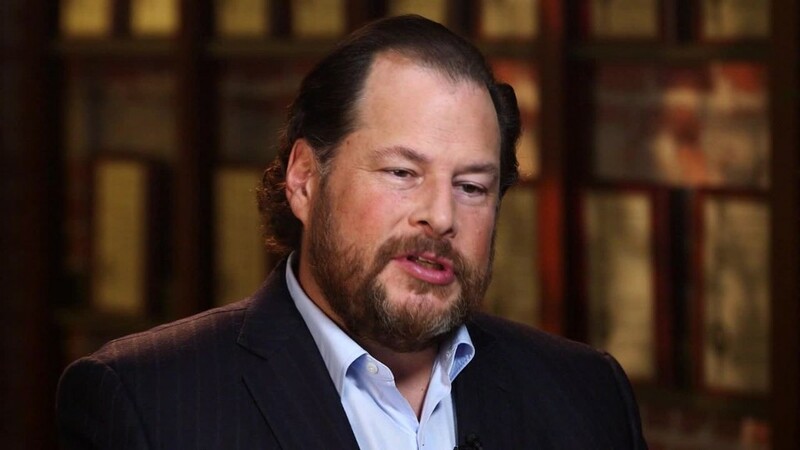 I think there's a huge amount of innovation in Silicon Valley that is getting monetized," Salesforce.com (CRM)CEO Marc Benioff told CNN's Poppy Harlow in an interview at his software company's San Francisco headquarters. Benioff believes the current situation is "very different" from 2000, the year the dot-com bubble burst. During that bubble, unproven companies like Pets.com and eToys.com went public despite earning little to no actual revenue. The thinking was that any Internet company would be able to grow to profitability. But many imploded, crashing the Nasdaq and the broader stock market. The key difference now is that today's startup superstars "are real companies with very significant revenue streams," he said. Benioff specifically praised Airbnb, Dropbox and Uber as "very exciting" companies. Eye-popping numbers: However, even the Salesforce chief acknowledged that things may be getting a little silly. "For some reason these D-round valuations, which are later-stage rounds, are extremely high. I think that's the right way to characterize them. I've looked at the numbers," he said. The numbers are eye-popping. Mobile app SnapChat raised money at a $19 billion valuation in February, doubling its price tag from just three months prior. Uber recently drove away with a $50 billion valuation, up from "just" $18 billion a year ago. Its current valuation makes it worth more than nearly 80% of the companies in the S&P 500 index. While that sounds outlandish, Uber is a real force that is disrupting taxi services around the world. But to Benioff's point, it may be debatable what the exact valuation of some of these companies should be, but at least they bring in revenue. Reports suggest Uber could generate more than $2 billion in revenue this year. That's something Pets.com could never claim. Microsoft marriage? Of course, Salesforce.com has no problem making money either. The company recorded over $5 billion in sales last year alone. That's one reason why Microsoft (MSFT) recently offered $55 billion to buy the company, according to reports. Benioff declined to comment on M&A rumors. However, he did acknowledge a much better relationship with Microsoft since Satya Nadella took over for Steve Ballmer as CEO. "When Microsoft got a new CEO, we got a new relationship," he said. "We've been able to create an alliance." It remains to be seen whether that alliance will turn into something more serious.